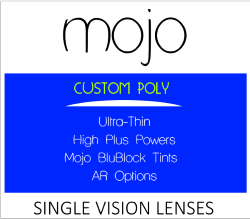 High Powers, Thinner Lenses, Transitions Lenses, and more! There are many lens options that you can purchase for single vision prescription lenses right on the frame page. However, if your prescription is over those stock lens ranges, we have special lenses that are custom made to your prescription and the frame you choose to be as thin as possible. 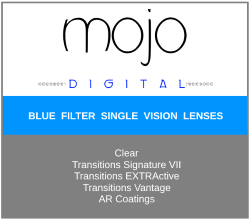 This collection of lenses all have unique lens options that help reducing glare and HEV blue light. 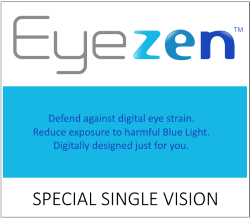 These lenses are available to anyone with a current prescription and PD measurement. Read about how to order them at the bottom of this page. Custom surfaced to be as thin as possible. Scratch Resistant and UV 400. 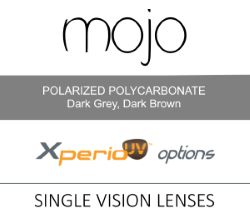 Xperio and other polar sun lens colors. * w/ small amount of plus power for reading. Add the frame to your cart. Do Not Select Any Lenses or Lens Options. Come back here and select your lens. On the lens page you can select various options and upload your prescription and PD.